My Bride of Pinbot has received a lot of loving attention since I purchased it. Now, I’m facing the final mountain before I can say – It’s complete!. Doing up the cabinet was always going to be one of the final two things to be done. It was a bit of a race to see if the final challenge would be the playfield or the cabinet, with the cabinet winning (or is it losing?) that race. The plan had always been to do it around late December last year or early January this year, but that got pushed back to February – and here we are! I spent quite a bit of time last year deciding what path to take with the new decals. Do I keep it original with new BoP decals from PPS? Or now that it’s a 2.0 machine, go with 2.0 decals from Retro Refurbs. In the end, after much deliberation and weighing pros and cons, I went with a 2.0 make over. Some may hold back tears while proclaiming – “But it’s not original anymore!”. Meh. This is a 2.0 machine now. It will remain a 2.0 machine. I love 2.0. There are not many 2.0 machines in the world and very few that are done up in this manor. So new 2.0 decals were purchased to bring this cabinet back to life. Naturally they arrived the day I started back at work (after 4 weeks of leave), which means the process will take longer to get done. The decal set includes the head box, cabinet sides, coin door and a 2.0 translite. The art is heavily based on the original, but with a more modern look (and some 2.0 branding). I have a Bride of Pinbot playfield for sale. If my machine had not come with the extra playfield, I would have been more than happy to keep using this one. – Close to the scoop entry. – Left / right loops. – Start of shuttle and heart beat ramp entries. – Top of left return lane, just below the extra ball insert (this has been touched up by someone in the past). – Right return lane, at the rear of the shuttle (also looks to have been touched up by someone in the past with a small mylar patch applied over the top). – Red ring on lower and left pop bumper (the rest of the area is covered in mylar). – The edges of the 500K insert on the right loop (the mylar stops just below it). – Base of the green insert on the left loop (mylar stops just before this one too). – Towards the entry of the heart beat ramp, but doesn’t look to have lifted much (if any) art. – Some of the large and small wheel inserts have some mylar lift, but does not look to have damaged the insert and the insert is not risen. 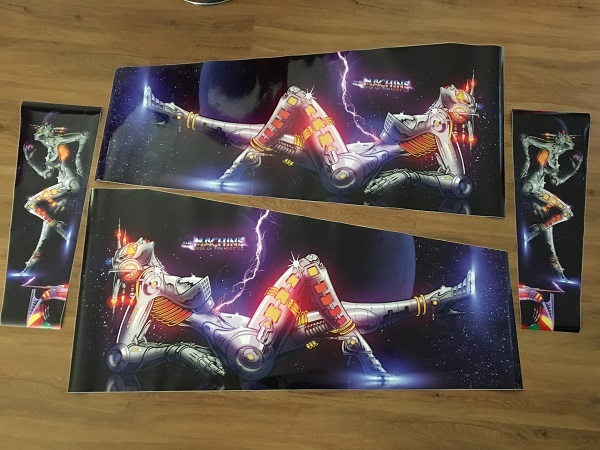 – A couple of the 100K/50K/25K inserts – again does not look to have damaged the insert and the insert itself has not risen. There is also some wood damage on the rear of the playfield around the pop bumper area. Doesn’t seem to affect the playfield or assemblies though. The two pop bumper body screw holes on the lower pop bumper are larger than normal – so these should probably be filled (match sticks / skewers + glue – or similar to fill before screwing). Sounds like a lot of negatives, but I’m being super critical. It is 28 years old after all and has held up well. I’ve included some photos to show how it looked in my machine to show how good it looks as a straight drop in. 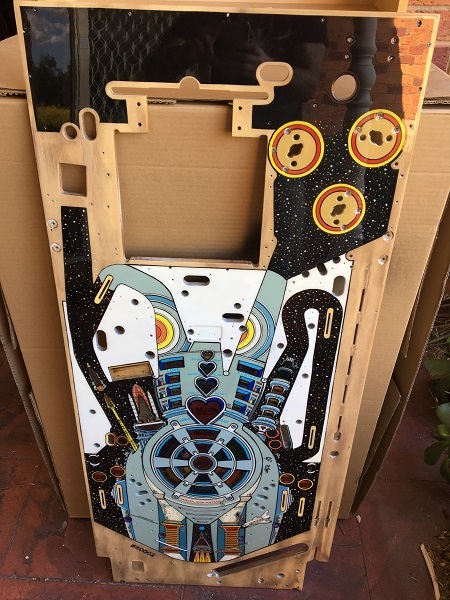 The playfield would be a good upgrade to a machine with a trashed playfield, or some touch up work and clear coat to have it looking like new again. Price is $280AU + shipping. Who likes self punishment? I do, it seems. My BoP 2.0 machine came with a touched up and clear coated playfield when I purchased it 14 months ago and it’s a task I knew I would get to at some point. But when you’re having fun playing a game, it’s hard to take it offline for some major changes. 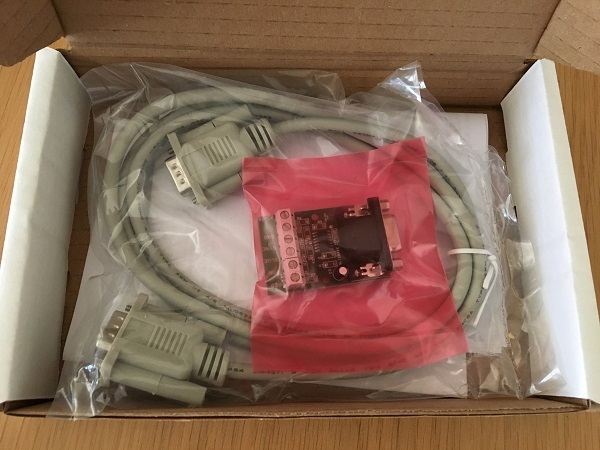 Playfield swaps are a time consuming process, so it’s not something I’ve been looking forward to. I gained some excellent experience when I did my Pinbot CPR playfield a couple of years ago and I’ll be rolling that knowledge in to how I approach this one. The up side here is the replacement playfield is an existing playfield, so all screw holes (both sides) are already there. New playfields have (most) screw holes dimpled, but can be up to 1mm out in any direction (according to CPR – not sure if that also applies to other playfield makers). On my Pinbot playfield, I found many dimples missing on the underside. This can be a pain for assemblies under the playfield that are made up of 2 or 3 components, consisting of up to 12 screws, which all need to line up in order for it to operate smoothly. 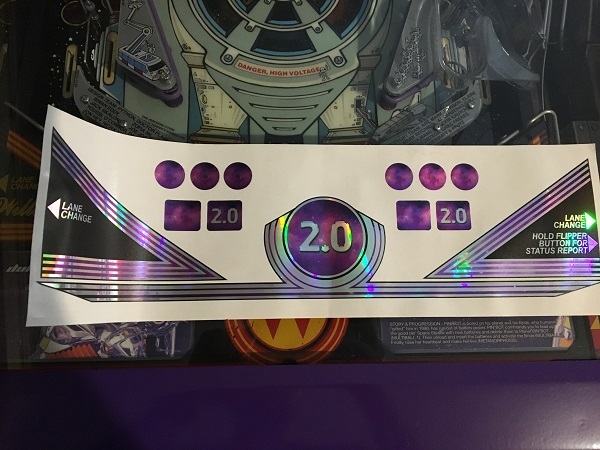 The current playfield in my game isn’t bad by any stretch as mylar across the central playfield and pop bumper areas has protected most of it. I actually think it would make a great drop in replacement for someone who has a trashed playfield or someone who wants to touch up and clear coat one for themselves. Time to begin the process.